A specialist in Early American literature, Ed Gallagher has been on the trail of pedagogical reinvention since 1997. He worked his way through Cindy Selfe's Computers in the Writing Intensive Classroom workshop at Michigan Tech, Randy Bass's American Studies Crossroads workshop at Georgetown, Tracey Weis's New Media Classroom workshop at Millersville, and was a charter member of Georgetown’s Visible Knowledge Project. Along the way he became teaching page coordinator of the web site for the Society of Early Americanists and editor of SiteScene, a web site review of the Crossroads program at Georgetown. 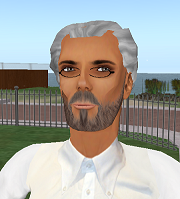 He now teaches primarily in computer classrooms, is an online teaching veteran, and has served as Lehigh Lab Fellow, pioneering classes in digital video, iPods, and (as EdwardScholarhands) virtual worlds. Six of his web projects are part of Lehigh’s Digital Library under the title History on Trial, a seventh on “The UFO Controversy” is under way, and his work on the discussion board has received significant attention.